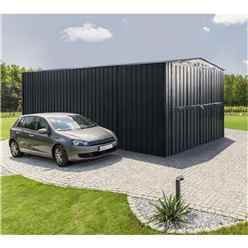 Exceptional Metal Garages To Buy Online At The Lowest Prices Possible. 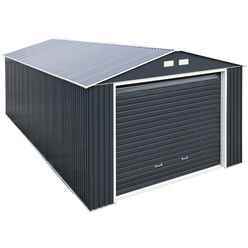 We offer a wide range of metal sheds from small compact metal sheds, pent metal sheds, to large metal garages. We stock a wide range of metal shed brands from Yardmaster, Madrid, Clifton and Rowlinson, and we offer a 48 hour delivery service on all metal Escape sheds. When anchored to the manufacturer’s recommendations, metal sheds are engineered to withstand tested wind speeds of 147km/h - more than enough to withstand the worst of the British weather! Metal sheds also offer the advantage of being virtually rodent-proof, and more resistant to poor weather conditions than the equivalent wooden sheds. Metal garden sheds offer the option of storing seed and grain without the issue of it being eaten away by rats, mice and termites. In addition to this, our metal storage sheds are fire retardant, giving you peace of mind over the safety of your valuables. As most of our metal sheds come with a 10 year anti-rust penetration guarantee, you can have peace of mind that your metal shed will remain a useful addition to your garden. Recently amended fire regulations on campsites has meant that customers are no longer able to use wooden sheds for storage purposes which has meant a metal shed as a perfect campsite / static home storage solution. 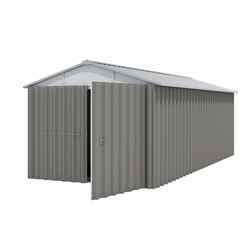 Metal garden sheds are available as either apex metal sheds or with a pent roof, and there are single and double door metal storage sheds options on both available. 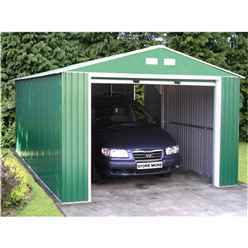 We also offer a number of metal garages ideal for securely parking your car. 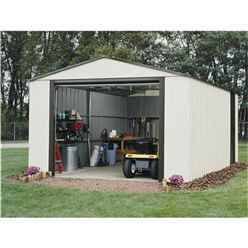 A metal shed is great for any time of year as they are rust resistant. When it comes to building your metal shed, you need to consider two things - the site of the metal shed and the foundation. These will ensure your garden building remains sturdy for years to come. Preparing the site of your metal shed is essential. You need to make sure that it is in an area that is clear of trees, garden fences and other obstacles. It also needs to be a level area in which to lay a solid foundation and an area that is free from standing water. Once the site is level and free from water and other obstructions, you can start thinking about the foundation of your metal shed. It needs to be strong enough to take the weight of a metal shed as well as just slightly larger than your actual shed to make sure there is no overhang. 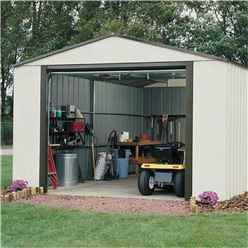 All metal sheds and storage must be erected on a firm, level (preferably concrete) base and unless stated metal sheds do not come with floor panels as standard. On our Madrid and Clifton range we do offer a timber base or foundation kit optional extra. 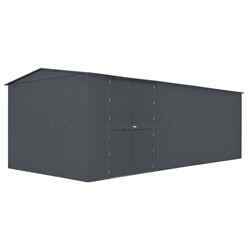 All metal sheds will need to be secured to the floor using an anchor kit to stop your metal shed from blowing away. We strongly recommend a concrete base but you can use paving slabs but need to take into account when drilling the paving slabs for the anchor kit that the slabs may split. Our range of metal sheds are constructed from hot dipped galvanised steel which, along with their stainless steel screws, is thoroughly rust resistant and they are supplied with a minimum of 10 years anti rust guarantee. The hot dipped galvanised steel is hemmed to provide smoother and safer edges. The sliding doors on metal sheds allow easy access to your gardening equipment, even in smaller gardens where space is at a premium.